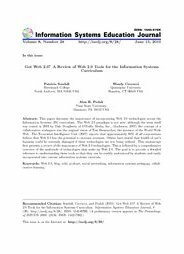 Abstract: This paper discusses the importance of incorporating Web 2.0 technologies across the Information Systems (IS) curriculum. The Web 2.0 paradigm is not new; although the term itself was coined in 2004 by Dale Dougherty of O’Reilly Media, Inc., (Anderson, 2007) the concept of a collaborative workspace was the original vision of Tim Berners-Lee, the inventor of the World Wide Web. The Economist Intelligence Unit (2007) reports that approximately 80% of all corporations believe that Web 2.0 has the potential to increase revenues. Others have stated that health of one’s business could be seriously damaged if these technologies are not being utilized. This manuscript first presents a review of the importance of Web 2.0 technologies. This is followed by a comprehensive overview of the multitude of technologies that make up Web 2.0. The goal is to provide a detailed reference to understanding these tools so that they can be readily understood by students and easily incorporated into current information systems curricula.